Boulder on a glacier. Glaciers are slow-moving rivers of ice that form at high altitudes, flowing down mountain valleys to lower elevations. 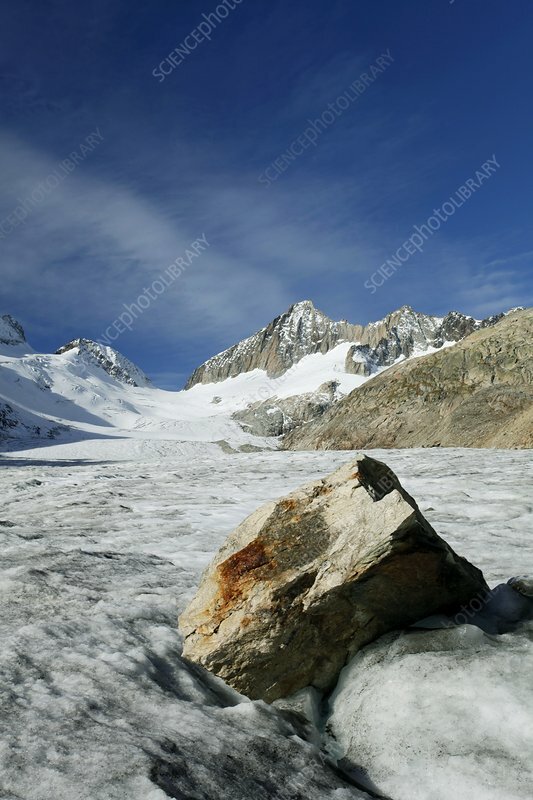 The weight of the ice erodes the underlying ground, and boulders and stones can be carried long distances by the glacier, either within it or on its surface. Deposits of such rock debris are called moraines, and large boulders eventually left behind by glaciers are referred to as erratics. This boulder is on a glacier accessed from the Grimsel Pass, in the Swiss Alps, in the canton of Bern, Switzerland. This pass reaches an elevation of 2165 metres.